Gina M. DeLustro received a bachelors degree from St. Johns University in 2007. In 2011, Gina received her Masters Degree in criminal justice from Long Island University at CW Post Campus. Gina received her JD from Touro Law Center in 2015, and was admitted to practice in the State of New York in January of 2016. As a law student, Gina interned with both the Nassau and Suffolk County District Attorney's Offices, where she was able to assess and communicate plea deals on criminal cases. She was also afforded the opportunity to intern under the Honorable Fernando Camcho, an acting Supreme Court Justice, in the Cohalan Court Complex, in Suffolk County New York. At this time, Gina worked along side Judge Camacho and several other interns, attorneys, and law enforcement agencies in helping to start the Felony Youth Part in the Suffolk County District Court. Since admission, Gina has practiced in the areas of traffic law and criminal law, making appearances in various traffic courts throughout the State, as well as the Nassau, Suffolk, Kings, Bronx and New York City Criminal and District Courts. 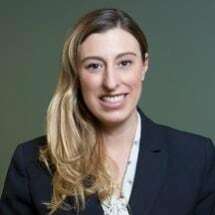 Gina is a member of the New York State Bar Association, New York City and Nassau County Bar Associations as well as New York County Lawyers Association.